Most everyone in our school uses TeacherWeb to create their classroom websites. Our administrators expect us to have a syllabus that outlines our expectations, management plan, and grading policies. Typically part of the syllabus is specific to the teacher and the rest are policies that our Algebra PLC adheres to. We all typically list our schedule, when we offer tutorials, a supply list and a class calendar. A goal I have is to make my website helpful to students and parents. I post the homework there as well as helpful links that illustrate the work we are learning in class. It will take some time for high schoolers to get used to checking the website but over time I am hopeful that the website will promote ownership over their learning. In just the first week, a few of the cross country students who missed class have emailed me about assignments. I was able to direct them back to the website for information. 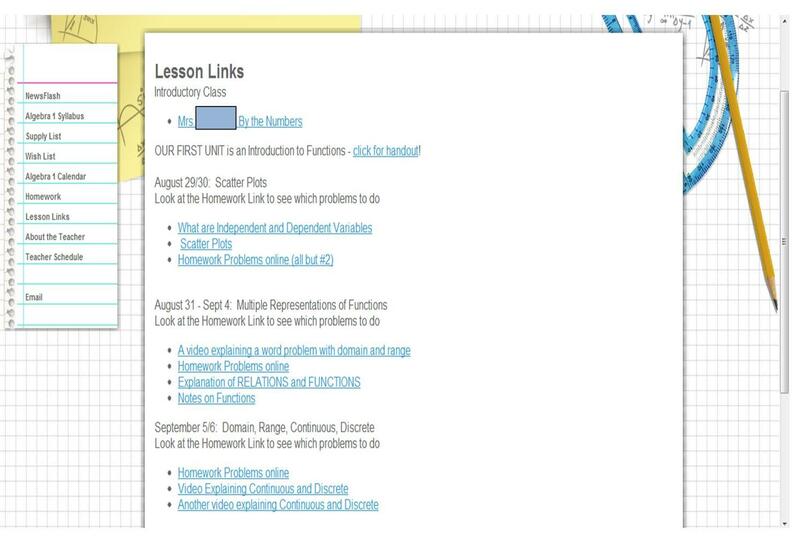 This entry was posted in Made4Math, Math at School and tagged class website, Syllabus, TeacherWeb. Bookmark the permalink.